In Chicago, power is distributed by wards, its history full of “ward bosses” that ruled the city. And competition to represent those wards is tough; especially, in next month’s aldermanic election for the seat of incumbent Alderman Patrick O’Connor. 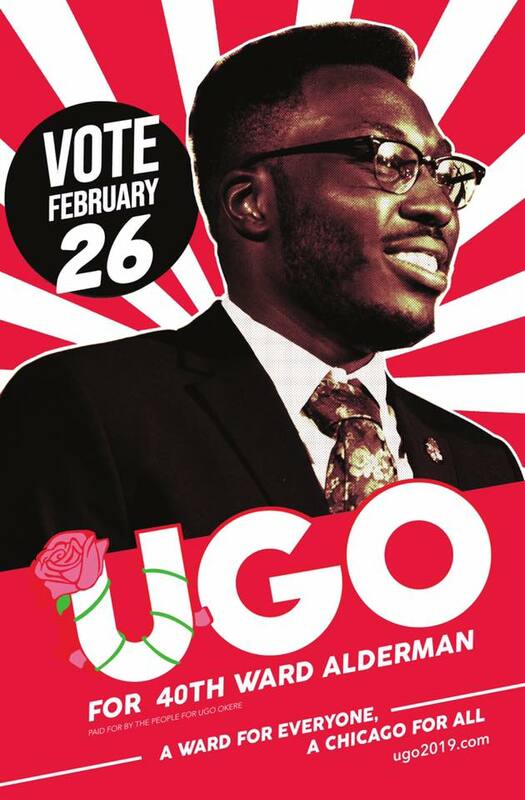 In a race packed with progressive competitors there’s one who most gets on O’Connor’s nerves: Ugo Okere, 22-year-old, Nigerian immigrant and DSA-endorsed socialist. At a candidate forum back in October, O’Connor used his closing statement to attack Okere for attending a campaign fundraiser held by his local Nigerian community and family. Brandishing a flyer for the event in his hand, O’Connor cried out to the crowd, “It doesn’t talk about community, it talks about building Nigerian power in Chicago,” garnering boos. The next day, the forum moderator called out O’Connor for being “a racist troll.” More recently, in early January, the alderman took a pot shot in a Chicago Sun-Times interview at his young opponent’s economic and housing situation: “At one point in time, having experience and being steady and dependable were virtues. Now apparently, they’re not. Now, having no work history, living in your parents’ basement until you get elected, knowing nothing — now, that’s the best way?” The Chicago Sun-Times article in question was not an article about the election. It was on O’Connor’s recent appointment to chair of the city council Finance Committee. It seems that, instead of asking why Okere is living in his parent’s basement, a more relevant question O’Connor might ask is why Okere has taken up residence in O’Connor’s head – rent free. Okere – tall, well-dressed, big smile, friendly demeanor – is not someone by whom most people feel threatened. Every few weeks, since the beginning of his campaign, Ugo – tall, well-dressed, big smile, friendly demeanor – has hosted “Listening Sessions” for 40th Ward residents. He stations himself up in a local cafe or library for a few hours and anybody is welcome to stop by and tell him what improvements they’d like to see in the ward. It’s not uncommon for these listening sessions to result in updates to his platform. More community gardening spaces. Better buses with all door onboarding. More after-school programming for teens. When talking with Okere, even outside of these listening sessions, he’s more likely to ask you for advice instead of sharing his own agenda. He knows he doesn’t have all the answers. He’s not a political shark, a species that thrives in Chicago’s political waters. He’s not going to stab you in the back or tell you anything other than his honest opinion. That doesn’t, however, mean he’s toothless. Much of the strength in Okere’s campaign, and what makes him so dangerous to O’Connor, is his platform. Beyond creating more gardening spaces, Ugo’s platform is deeply socialist, featuring three core tenets: Co-Governance, Equity, and Inter-Connected Struggle. On the “Issues” page of his website, Okere talks about establishing progressive taxes that hit at the most wealthy and redistributes their resources to the most marginalized and oppressed Chicagoans. He calls for an elected school board (Chicago’s school board is appointed by the mayor) and expresses solidarity with the Chicago Teachers Union. The list goes on: abolish ICE and offer sanctuary for all; seek environmental justice and fund the replacement of lead pipes across the city; create a Civilian Police Accountability Council; lift the ban on rent control and create housing for all. 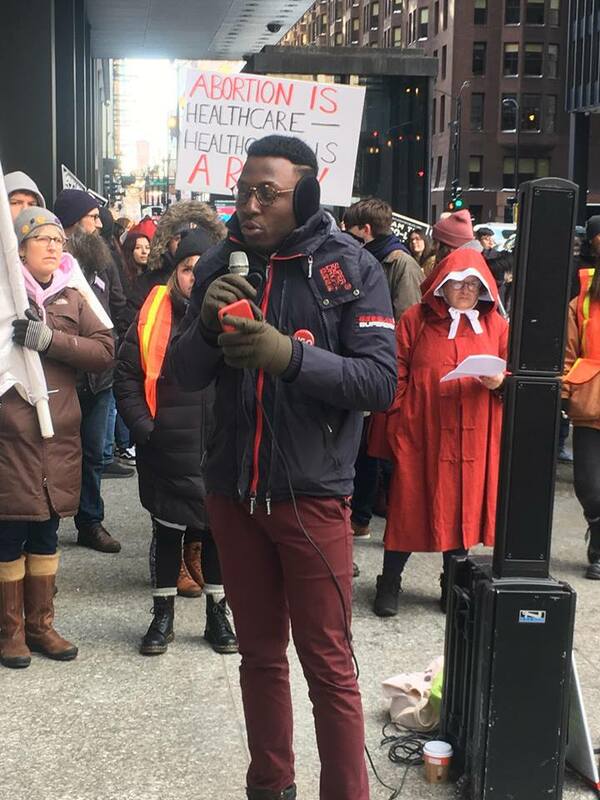 It’s a platform that that demands a Chicago For All, with no exceptions, and Okere’s hope is that it captures the attention of a ward that Bernie Sanders won in 2016 by more than ten percentage points. The three other candidates challenging O’Connor in this race – Maggie O’Keefe, Dianne Daleiden, and Andre Vasquez – all label themselves progressive but fall right of Okere. Maggie passes out literature that lists as one of her priorities “Housing that benefits all,” – a vague, undefined statement reminiscent of Democrat’s “Access to Affordable Healthcare.” Andre endorsed by Reclaim Chicago, and Dianne, endorsed by Chicago Teachers Union, are both supportive of many the same policies as Okere but still come up short. Immigration policy is missing entirely from both of their websites, let alone a call to abolish ICE, an interesting choice given that ICE arrested and deported hundreds of people in the Chicagoland area in 2018 and continues to use the nearby Gary Airport as a deportation flight hub. And neither candidate has adopted the same socialist framework that Okere has. O’Connor himself can barely be considered a Democrat, let alone a progressive, given his deep connections to developers in his ward and his past membership in the 1980s Vrdolyak 29 caucus that systematically handcuffed mayor Mayor Harold Washington. It takes more than having the strongest rhetoric in a race to earn support from the left in Chicago, which is why Okere lives what he preaches. He was there (see photo) at this year’s March For Life, a yearly anti-abortion rally held in downtown Chicago that’s packed with bused-in out-of-town Catholic teens: Okere stood in front of a much smaller group of pro-abortion counter protesters organized by the Chicago DSA Socialist Feminist Working Group and spoke on the importance of abortion on demand and without apology. He marched and chanted with the counter-protesters for over an hour in the Chicago winter while faced by a massive crowd of anti-abortion bigots and flanked by a small contingent of white supremacists. And this is not out of the ordinary for him. Through the course of his campaign Okere also stood on the picket lines in solidarity with striking hotel workers in downtown Chicago and with ACERO charter school teachers in two separate instances. But perhaps the biggest proof of Okere’s conviction is his involvement with Chicago DSA. Unlike most DSA-endorsed candidates, who approach the organization from the outside, Okere is one of few who came from within. Okere helped organize with CDSA’s Housing Working Group as well as the Electoral Working Group, but the most telling is his path to CDSA endorsement. At CDSA’s initial endorsement meeting, due to concerns about chapter capacity, Okere fell only a handful of votes short of earning CDSA’s endorsement. But, he didn’t abandon the organization. 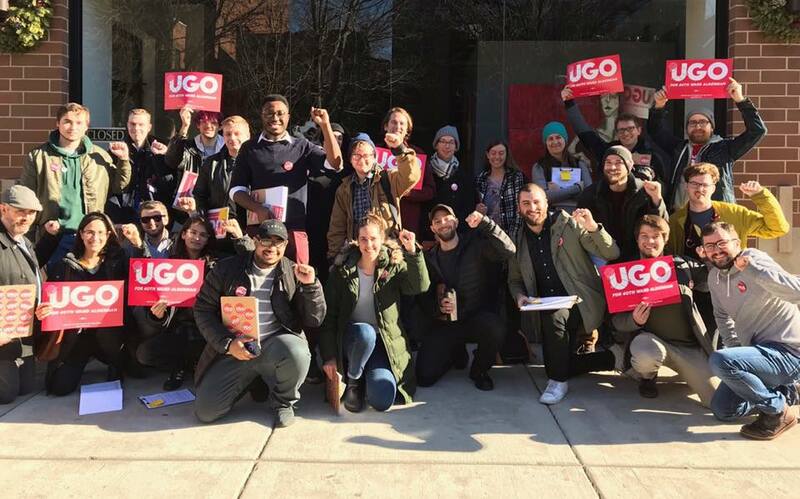 While running his campaign, Okere stayed involved, kept organizing, and when the next general meeting came around a few months later, Okere won CDSA’s endorsement by a wide margin. Okere’s position as the leftmost candidate in this race has paid off for him. Not only did he win the endorsement of both Chicago DSA and national DSA but, he’s also leveraged his platform into a deep and committed volunteer pool. Using relationships that he built through organizing at Loyola University, with CDSA, and talking to his community, Okere attracted dozens of people to his campaign, all won over by his bold plans for the city and ward. His staff of 13 has only two paid members, the rest choosing to give their weekends, evenings, and their lunch breaks to help Okere become an alderman. His weekend canvasses often draw dozens of volunteers to help him knock on doors in the ward. While polling data for this race is basically non-existent, it’s hard to not see him as a viable contender to O’Connor based solely on the energy in his campaign and its supporters. So, it’s no wonder that O’Connor, who’s been on city council for 35 years, finds Okere irksome. Not only do his politics stand in drastic contrast to O’Connor’s, but Okere pokes and prods at the alderman every chance he gets. After O’Connor’s “Nigerian power” comment at the forum, Okere circulated a petition on social media calling for O’Connor to retire along with a statement labeling him “out-of-touch” and “cruel.” Recently, when the news came out that O’Connor was appointed chair of the Finance Committee, Okere released a statement that leveled this accusation: “Alderman O’Connor’s past has also been riddled with suspicion of pay-to-play politics and nepotism, including a real estate business that his wife brokers for which has sold $22 million worth of homes in our ward thanks to his zoning privileges.” It was just days later that O’Connor brought up Ugo’s living situation in the Sun-Times. These two candidates are about a month away from election day February 26, and despite the attention Okere has brought to his campaign, he still has a long uphill battle before he wins. He’s been outfunded, not just by O’Connor, who has a immense campaign war chest, but by Vasquez and Daleiden as well. Even the date of the election works against Ugo. February 26 is middle of the bitter Chicago winter and, without a federal or state election scheduled at the same time, most Chicagoans choose to stay warm in their homes. Okere and supporters at the recent CDSA Housing For All Day of Action. There is one thing working in Okere’s favor, which is Chicago’s runoff system. If, on February 26, no candidate wins 50% of the vote or more, a runoff between the top two vote getters is triggered. With five candidates, and multiple viable ones, it seems unlikely that anybody will take home a majority of votes so a runoff seems inevitable. For Okere, this means he just needs to beat out his progressive competition if he wants to end up in a true showdown with O’Connor. The fight in the 40th Ward is one that’s mirrored all across the city in various shapes and sizes: a long standing, Chicago machine politician versus an exciting young, left candidate. Chicago DSA has endorsed three other city council contenders, and many other races with similar dynamics are taking place in the city’s 50 wards. But, of them all, the contrasts between O’Connor and Okere are perhaps the most stark: young against old. Nigerian immigrant against old-school Chicago racist. Socialist against capitalist. It’s hard to say what will happen next month. Okere will need to keep running a tough campaign, and he’ll need as much help from DSA and his supporters as he can get if he wants to bring down a long standing incumbent like O’Connor. But, he’s clearly gotten to his opponent, and that’s proof that he’s doing something right. Zach Shearer is a member of Chicago DSA.